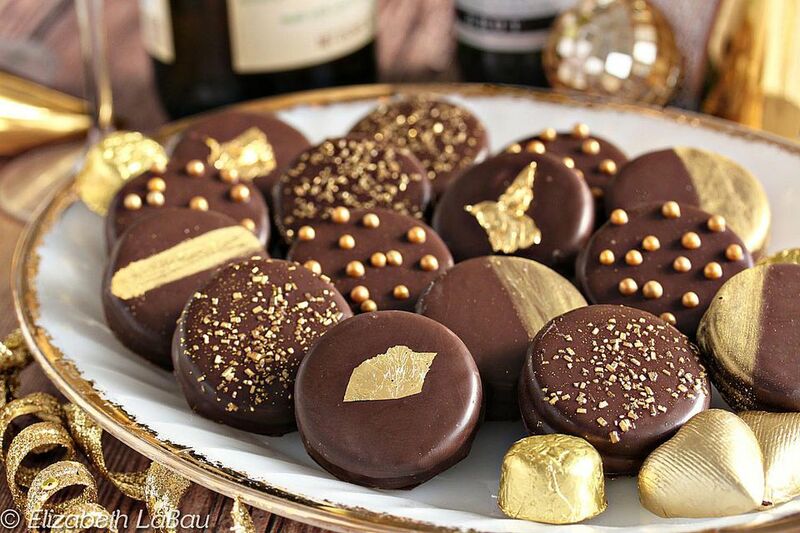 Glittery Gold Chocolate-Dipped Oreos are dressed to impress and ready for a party! These easy chocolate-coated cookie are one of my secret weapons for putting together a classy dessert selection in no time flat. Dipping cookies in chocolate is ridiculously easy, but with the right decorations, even this simple dessert can be fancy! The decorating possibilities are endless, but I usually stick to a few options: gold pearls and sprinkles, gold luster dust, and edible gold leaf. You can probably find the pearls and sprinkles at many craft or grocery stores, the luster dust can be found at cake supply stores, and the gold leaf might be at cake stores, or you might have to order it online. Make sure that you get edible gold leaf, and definitely check out the photo tutorial showing how to use gold leaf if this is your first time playing with it! Place the chocolate candy coating in a medium microwave-safe bowl. Microwave in 30-second increments, stirring after every 30 seconds to prevent overheating, until the coating is melted and smooth. Using forks or dipping tools, dip a cookie in the chocolate coating until it's coated completely. To add gold pearls or gold sprinkles: While the chocolate is still wet, sprinkle a pinch of gold pearls, gold sparkling sugar, gold sprinkles, or similar small decorations, all over the top of the cookie. Once all of your cookies are decorated, refrigerate the tray to set the chocolate, for about 15 minutes, until they're set and firm. To add gold luster dust: Dip the cookie and leave the tops plain. Refrigerate the tray to set the chocolate, for about 15 minutes. Once set, take a clean, dry, food-safe paintbrush and dip it in the luster dust. Brush the dust on top of the chocolate-dipped cookie. You can cover the whole cookie with gold powder, paint a stripe across the top, color just one corner, or all of the above! Water is the enemy of luster dust, so make sure that your paintbrush is dry before beginning, and that your cookies don't have any condensation on top. Once painted, the cookies are ready to serve! To add gold leaf: take a sheet of edible gold leaf, and cut away a small square of gold leaf with a sharp paring knife. Pick up the piece of gold leaf using the tip of the knife. Carefully move it over to the top of the dipped cookie. Lay the gold leaf on the cookie's surface, and use a dry brush to push it down and get it to attach to the chocolate and detach from the blade. Use the brush to gently pat down the leaf and press it onto the cookie so that it is in a smooth, even layer.